With a stay at Aparthotel Sole Bello, you'll be centrally located in Torrevieja, a 3-minute drive from La Mata Beach and 10 minutes from Aquopolis Torrevieja. 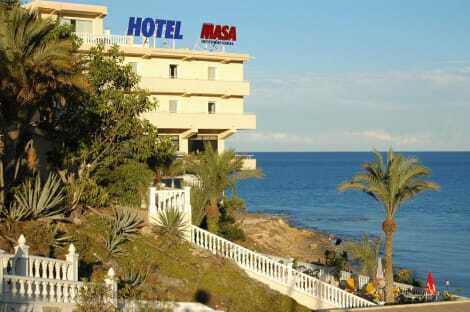 This aparthotel is 5 mi (8.1 km) from Torrevieja Harbour and 7.8 mi (12.6 km) from La Marina Beach. Situated in the city centre, this hotel is close to Natural History Museum, Sea and Salt Museum, and Archpriestal Church of the Immaculate Conception. Also nearby are Torrevieja Casino and Torrevieja Harbour. The residence offers a number of recreational amenities, which include an outdoor pool and a SPA tub. Guests can also enjoy refreshments in the cosy bar/lounge and the charming coffee shop. The hotel comprises a total of 42 rooms spread across 5 floors. They all feature a balcony and air conditioning as standard, and are further equipped with televisions with cable channels and complimentary Internet access. When you stay at Hotel Playas de Torrevieja in Torrevieja, you'll be by the sea, a 1-minute drive from La Mata Beach and 8 minutes from Aquopolis Torrevieja. This family-friendly hotel is 4.9 mi (7.8 km) from Torrevieja Harbour and 8.8 mi (14.1 km) from Zenia Boulevard Shopping Center. Grab a bite at El Cucharon Bar, one of the hotel's 2 restaurants, or stay in and take advantage of the room service (during limited hours). Snacks are also available at the 2 coffee shops/cafés. Relax with your favorite drink at the bar/lounge or the poolside bar. Buffet breakfasts are available daily from 7:30 AM to 10:30 AM for a fee. When you stay at ApartHotel Atlas in Torrevieja, you'll be on the waterfront, within a 10-minute drive of Aquopolis Torrevieja and Zenia Boulevard Shopping Center. 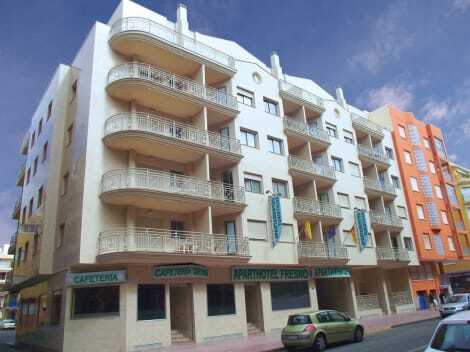 This aparthotel is 6.9 mi (11.1 km) from La Mata Beach and 3.3 mi (5.4 km) from La Zenia Beach. With a stay at Apartamentos Turísticos Fresno, you'll be centrally located in Torrevieja, steps from El Cura Beach and within a 10-minute walk of Los Locos Beach. This apartment is 0.7 mi (1.2 km) from Plaza de Oriente and 0.9 mi (1.5 km) from Archpriestal Church of the Immaculate Conception. This charming hotel enjoys a great setting in Torrevieja, lying just 900 metres away from the pebble beach. Guests will find themselves just 4 km from the centre of the town, where they can explore the range of shops, boutiques, cafes and bars that it has to offer. This wonderful hotel is located just a short distance away from a host of attractions in the area. The airport is located just 48 km away from this hotel. This charming hotel greets guests with the promise of an enjoyable stay. The guest rooms are tastefully designed, and come complete with modern amenities for added comfort and convenience. Guests are invited to enjoy a leisurely swim in the pool, or simply lie back and relax as the little ones splash nearby. Known in English as 'old tower', Torrevieja is celebrated for its particularly mild winters and receives very few frosts thanks to its proximity to the Salinas de Torrevieja (natural salt water lakes). The salt lakes are now an important nature reserve, and are renowned for their rich birdlife and scenic sunrise views. This intriguing church was first built in the 18th century but, following an earthquake in 1829, was rebuilt with local stone in the 1840s and designed in the Neoclassical style. The Iglesia Arciprestal De La Inmaculada Concepción is also known for its fine religious art collection and prominent pyramidal towers, and is unequivocally the main historical focal point of Torrevieja today. The perfect attraction for a fun family day out, the Aquopolis Torrevieja is a stunning water park organising plenty of themed activities throughout the warmer season, from face-painting and bowling to water-based leisure activities. With its incredibly clean turquoise waters and pristine sands, Las Salinas Beach is one of the finest on the entire Costa Blanca. The beach is also within easy reach of Torrevieja hotels, and is overlooked by plenty of stylish bars and lively restaurants. See the enchanting Plaza del Cardenal Belluga square and the majestic Cathedral of Murcia, the latter of which is more than 600 years old and is acclaimed for its elaborately decorated Baroque façade. The medieval city, which is one of the warmest in Spain, organises the annual Three Cultures International Festival, which promotes stronger ties between Christianity, Islam and Judaism, three religions that have exerted significant influence on Murcia's history. With its gleaming, golden sandy bay and eclectic, cosmopolitan nightlife, there are few places in Spain as lively as Alicante in the main holiday season. The city is also home to a fascinating archaeological museum, and is dominated by the Santa Bárbara Castle, which, despite successful sieges over the centuries, has stood since the Middle Ages. Visit the Porto Giglio Restaurante for a unique combination of delicious Mediterranean, international and British cuisine, or head to the Sands Bistro for other very tasty English and international-themed dishes. For some mouthwatering Irish classics, try Spud Murphy's, dine at the Casa Mia for some delightful Italian flavours, or go to El Patio Chico for some vibrant Spanish food. For impeccable value for money, you can book a stay at the pleasant Cabo Cervera hotel, the romantic Hotel Doña Monse, or the beautifully presented Hotel Masa International. Other reputed hotels you could consider include the comforSEOSITE_LEVEL_DESCRIPTION Apartamentos Turisticos Fresno, the immaculate Hotel Fontana Plaza, and the budget-friendly Hotel Cano.